REVOCATION get closer to being a progressive death metal band all the time. You know, instead of being a death metal minded prog band. Give a few spins to The Outer Ones (or clicks, I guess) and see just what I mean. 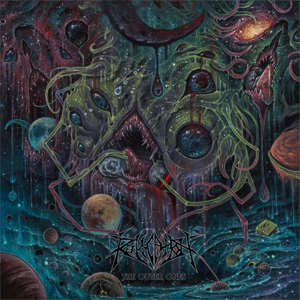 Album number 7 and never having released a bad album, The Outer Ones sees REVOCATION digging deep into the death metal side of their sound instead of peppering it amongst various techy thrashisms and guitar heroics. Not to be confused with a simpler approach, but definitely more streamlined, with David Davidson clipping the more jazz influenced playing of prior efforts in favour of a more pure and distilled groove. Listening casually is not an option here - REVOCATION demand your attention. Third track “Blood Atonement”, for example, somehow recalls the airy and ethereal intro of the best of the 80s before somehow channeling Benton and GOJIRA at once. It’s a thing of beauty, with an off kilter groove and drums that pop and weave around the riffs darting in and out of your ear holes. The title track is a face melter and paced perfectly in the running order of the album, balancing the prog tendencies of REVOCATION with the death metal they are so clearly embracing this time around. The band shows no signs of slowing, nor of stagnation. The ideas keep flowing and hopefully they do for a long time. As stated, take this one for a spin. Sit down with it. Buy it a coffee. With The Outer Ones, REVOCATION have another hit. If the band was previously a little too meedly for you then you should definitely get in here. Then work backwards. You know, like in the old days.